Just as you turn the wheels of your car to change direction, a pilot changes the deflection of the flight control surfaces to control how an airplane moves through the air. With a car you only have to worry about controlling the direction in two dimensions. Either you turn left or you turn right. Pretty simple...A pilot must be able to control the motion of an airplane in all three dimensions in order to maintain control of the aircraft. Just a little bit more difficult than driving a car wouldn't you say? 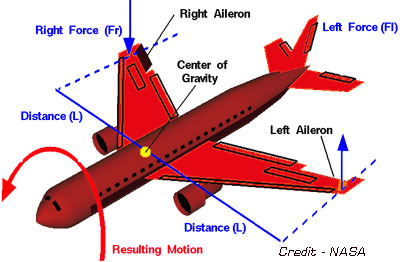 The center of gravity is the point at which the airplane balances both laterally and longitudinally. When the airplane is in flight it rotates around this point. To fly an airplane we must control this rotation in all three dimensions. We can define three axes that go through the center of gravity. Each axis is perpendicular (90 degrees) to each other. 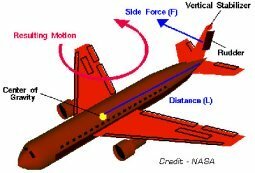 This will allow us to define the orientation of the airplane by the amount of rotation it has around each of these axes. The three principal axes are pitch, yaw, and roll. The pitch axis is perpendicular (90 degrees) to the yaw axis and is parallel to the wings. This axis starts at the center of gravity and points towards the right wing tip. A pitch motion is when the nose of the airplane moves up or down. The yaw axis is perpendicular (90 degrees) to the wings of the airplane. This axis starts at the center of gravity and points straight down. 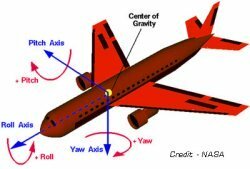 A yaw motion is when the nose of the airplane moves from side to side. The roll axis is perpendicular (90 degrees) to the other two axes. This axis starts at the center of gravity and points towards the nose of the airplane. 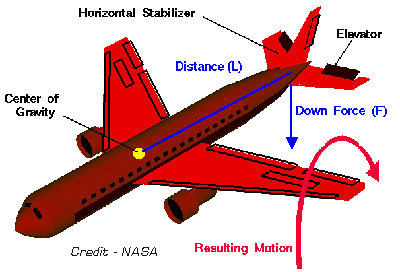 A roll motion is when the airplane's wings move up or down. Airplanes have a horizontal stabilizer and vertical stabilizer. Think of these like feathers on a dart. These are what keep the airplane stable in flight. The horizontal stabilizer keeps the airplane's nose from moving up or down. The vertical stabilizer keeps the airplane from moving side to side. Flight control surfaces are movable airfoils used to control the movement of the airplane. The three control surfaces that control the airplane's rotation around each principal axis are elevator, rudder, and ailerons. Lift produced by an airplane's wings is determined by the shape of the airfoil, the angle of attack, and the speed of the airplane. The same is true for the forces generated by each flight control surface on the airplane. How do pilots make airplanes move up or down? The elevator is a hinged extension of the horizontal stabilizer. Raising the elevator up or down changes the over all shape of the horizontal stabilizer's airfoil. When the elevator is raised the air going under the horizontal stabilizer has to travel farther than the air going over it. According to Bernoulli Principal this will decrease the pressure under the stabilizer causing it to be pulled downward. When this flight control surface swings upwards it deflects the air that is moving past the airplane upward. This means the air is in turn deflecting the elevator downward. OK, so we have an airplane that is balanced perfectly on its center of gravity which is always located at some point on the wings. The elevator raises up which generates a force that is pushes the tail down. The airplane pivots on the center of gravity right? Then pushing the tail of the airplane down will make the nose of the airplane rise. In other words, the elevator controls the pitch of the airplane. When the elevator raises the nose of the airplane raises. When the elevator is lowered the nose of the airplane lowers. If the nose of the airplane rises, the angle of attack increases. If the angle of attack increases then the lift produced by the wings increases. So by raising the elevator the airplane will gain more lift and start to climb. If the elevator is raised far enough and held in that position long enough then the airplane will do a loop. That is, if the airplane is designed to do a loop. Try that with a jet liner and you may have some issues! Conversely if the elevator is lowered the nose will lower. That will cause the angle of attack to decrease, and the airplane will descend. How do pilots make airplanes turn left or right? The rudder is a hinged extension of the vertical stabilizer. The rudder acts exactly as the elevator does except it controls the yaw of the airplane. When the rudder swings to the right it generates an aerodynamic force pushing the tail to the left. The airplane pivots on the center of gravity causing the nose to swing right. How do pilots make airplanes roll? Ailerons are flight control surfaces located on the trailing edge of each wing tip. Ailerons control the roll of the airplane. These are a bit different than the elevator and rudder because it takes two ailerons working opposite of one another to make the airplane rotate around the roll axis. When the right aileron raises it changes the overall shape of the wing's airfoil and produces an aerodynamic force pushing the right wing down. At the same time the aileron on the left wing lowers and produces a force pushing the left wing up. The airplane always rotates about its center of gravity. So we have a force pushing the right wing down and a force pushing the left wing up. This causes the airplane to roll in the clockwise position. This is considered to be "rolling" right. When the right aileron lowers and the left aileron rises the airplane will be "rolling" to the left. How do pilots make airplanes slow down for landing? Flaps are flight control surfaces located on the trailing edge of the wing just inside of the ailerons. On an RC airplane they work just like ailerons except the flaps on each wing work together in the down positions. Flaps never hinge upwards like ailerons. Flaps are used to create more lift at lower speeds when landing. 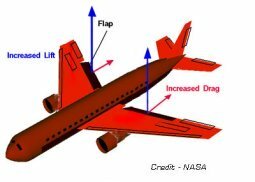 Not only do flaps produce more lift, they also produce drag. This helps slow the airplane down. The flaps will also affect the pitch of the airplane. When flaps are deployed it is necessary for the elevator to compensate for any changes in pitch caused by the flaps.